Sonnets are familiar from Shakespeare 101, and haiku have become ubiquitous on the Internet; but the ghazal is a poetic form that you may have missed. 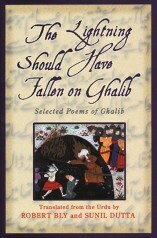 The ghazal, according to The Lightning Should Have Fallen on Ghalib: Selected Poems of Ghalib (Ecco, 164 pp., $21) comes from Persian and Indian tradition. The word itself means "a conversation with the beloved," and as translators Robert Bly and Sunil Dutta explain, the beloved may be a human lover or God. Mirza Asadullah Beg Khan was an 18th century writer of ghazals who took, as was the custom, a pen name: Ghalib or "Victorious." A free-thinking Muslim who lived in the tumult of increasingly colonized India, Ghalibs poetry of praise for God and creation is marked by an attitude that, while not disbelieving, acknowledging how the Great One can disappoint. The poems are full of unrequited loves and unanswered prayers, and Ghalibs voice is wry and rueful as he examines the role of illusion in faith and romance. In "The Candle That Has Gone Out," he describes the Garden of Paradise as "a bouquet on the bedstead of forgetfulness." The ghazal form consists of up to 15 long couplets, and usually each can stand alone as an imminently quotable mini-poem. Although it gets lost in the translation from Urdu, they have elaborate rhyme and meter and a structure in which a key wordsuch as "can" or "do"is repeated in a set pattern at the ends of certain lines. The last couplet of a ghazal often refers to the poet by nameas in the books title. "That lightning that fell on Moses should have fallen on Ghalib. / You know we always adjust the amount of the wine to the quality of the drinker." Thats something to know about Ghalib: Hes charmingly self-aware, whether the shortcoming under discussion is his boastfulness or  as in the puzzle above  his jealous nature.